Painted Red with a Big Block hood stinger with Black Stripe. New Black Convertible top, Rally rims with trim rings and caps like new. White wall tires, glass is good. Windshield trim is good, head lights go up and down good. Front & rear bumpers are good, side pipes, rear mounted antenna, drivers side outside mirror, door handles good, emblems good, tail lights good. Good looking car. Interior is Black, 4-speed in console, black padded dash is good. Black carpet is good, carpeted floor mats are good. Arm rest good, sill plates are good. Factory seat belts are good, door panels good, original AM/FM Radio, aftermarket radio mounted under dash Sony AM/FM/Cassette, black leather steering wheel, sun visors good, all factory gauges and clock. Looks good inside. Powered by the original 327 engine, Corvette finned aluminum valve covers, Holley carb, original cam style exhaust manifolds. 4-speed transmission. Drives and handles good. Visit our website at www.ecoastcc.com for more info. 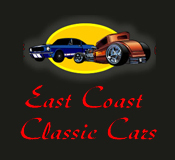 East Coast Classic Cars is owned and operated by Lin Cummings and Bonnie Daniels. Your satisfaction is the most important part of our business. This is the place to buy quality, a small part of history and glamour inherent with each of our classic cars. Our Classic Car collection began several years ago and has been growing rapidly with a large annual turnover. Come in and browse through our beautiful 35,000 sq. foot showroom, where you can view our large selection of cars. Follow us on Facebook as well! Do not hesitate to call or email us with your question. If you find a vehicle you want to purchase, we can assist with transportation arrangements also.